Only 14 years old when the Vessels Family began the rich quarter horse racing tradition at Los Alamitos Race Course in 1951, Edward C. Allred has watched his love for the world’s fastest horses progress to his 100 percent ownership of the nation’s quarter horse racing capital. When Allred first came through the turnstiles at Los Alamitos Race Course in 1956 there was no need for any fanfare. Allred was just a young law student at the University of Southern California and part-time racing fan who had read in The Daily Racing Form that the Allred Brothers were racing horses that day at the track. While the Allred Brothers proved to be no relation, that first trip out to Los Alamitos had a deep and lasting impact on the young student. I used to go to the races at Santa Anita and Hollywood Park with my friend, Tom Seibly, who is now a retired judge and on our board of directors at the track,” Allred remembers. “At the time, I only had a vague idea of what a Quarter Horse race was. I hadn’t ever seen one. But I loved it all from the very start. Punch Time was unable to get in foal right away. “Then I got drafted into the army and had to sell her. This was in ‘65. I spent two years as a captain in the medical corps - a year in Virginia and a year in Saigon, Vietnam,” Allred recalled. Allred would go on to enjoy one of the most memorable wins in the sport when the bay mare Charger Bar scored a neck victory over The Honker in the Champion of Champions on December 22, 1973. Allred owned Charger Bar, the all-time co-record holder at Los Alamitos with 18 stakes wins, along with partner Dr. Kenneth L. Wright. Charger Bar competed in the first three runnings of the Champion of Champions, as she also finished third in the inaugural 1972 running and fifth in the 1974 renewal of the sport’s most prestigious race for older horses. 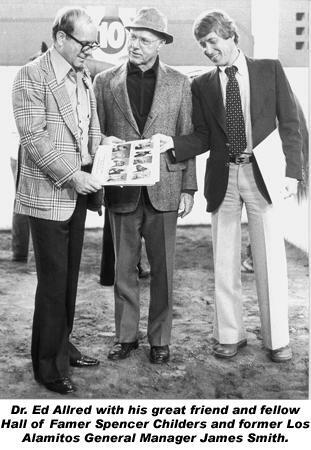 The early 1980s would test the mettle of some of these men when Millie Vessels decided to sell Los Alamitos Race Course to the owners of Hollywood Park. The Hollywood Park years were short and stormy at Los Alamitos and it was at this time that Allred decided to step in and attempt to purchase the track. This effort at first seemed to be in vain as Hollywood Park sold Los Alamitos to competing harness racing interests. However, in 1990 with the valued assistance of his close friend R.D. Hubbard, Allred was able to purchase one-half of the track. With his purchase of one-half interest in Los Alamitos Race Course, Allred was now placed in a position of being partners with a harness group with which he had always been forced to compete against for the night horse racing business. Shortly into this new arrangement, Allred and his new partners, Christo Bardis and Lloyd Arnold, formed a close working friendship that has lasted to this day. On February 17, 1998, after several years of friendly negotiating, Allred became sole owner of the track. Allred still breeds and raises top-notch Quarter Horses at his Rolling A Ranch in Atascadero, California. Allred has won AQHA’s Champion Breeder title nine times and the Champion Owner award six times. In the 1990s, he led all owners in number of victories eight times, and has topped all breeders in wins from 1992 through 2004. In 2004, horses bred by Allred won 111 races and 14 stakes races while earning $1,575,685. In addition to his strong racetrack stable, Allred’s Rolling A Ranch has been the home of top sires such as Raise A Secret, Walk Thru Fire and First Down Express. In past years, Allred’s ranch housed the super sire Raise A Secret, who sired such top horses as Kingman Kid, Girl Secrets, Daggers And Darkness, Pride Of Katella and Secret Card. The power of his broodmare band is evidenced by Separatist and Make It Anywhere’s sweep of the 2000 PCQHRA Breeders Derby and Futurity. Both horses were foaled by Allred’s great late broodmare Seperate Ways. Allred also owned the late great Jetsetting Girl. Her progeny include the Raise A Secret stallion Bridlewood, winner of the California Breeders Sophomore Stakes and an earner of $191,358. Bridlewood ran second in the PCQHRA Breeders Futurity and as a sophomore he was the California Hi Point Three-Year-Old Colt. Jetsetting Girl is also the dam of the Raise A Secret filly Girl Secrets, a winner of seven races and earnings of $177,552. She won the Golden State Derby, La Primera Del Ano Derby and California Sires Cup Derby and was second in the Southern California Derby and a finalist in the Los Alamitos Derby. Citation Five is another stakes winner produced by Jetsetting Girl. Also by Raise A Secret, this gelding won five races including the California Futurity. Jetsetting Girl's richest son is Gulfstream Five, who earned $225,827 while running in the Los Alamitos Million Futurity and finishing second in the Los Alamitos Winter Derby and PCQHRA Breeders Derby. Other sons out of this outstanding broodmare included Timothy Pilot ($121,479), who ran second in the Gold Rush Derby at 870 yards, and Easily A Secrets ($86,707), the runner-up in the California Sires Cup Derby. Allred still owns the talented broodmare Oh La Proud, the dam of champion stallion Hawkinson and 2003 champion 2-year-old colt Hawkish, and broodmares Mega Storm, who produced 2005 Los Alamitos Million finalist He Storms, Jetsetting Girl, the dam of Gulfstream Five, an earner of more than $220,000, and TL Pie. Allred is also the architect of syndicates that stands Separatist, the sire of last year’s All American Futurity winner DM Shicago, and rising stallion star Walk Thru Fire, the sire of Ed Burke Million and Golden State Million Futurity winner Higher Fire. Allred and Mike Abraham purchased Walk Thru Fire in a multi-million dollar deal in 2005. Allred also heads the Snowbound (TB), Harems Legacy and Masters Call syndicates.